360° Switchback We took everything we learned from an already amazing product and made it even better! With its six CREE LEDs, the V6 Triton switchback has taken the LED turn signal game to another level. I installed these on my 2012 Fusion and they were amazing. 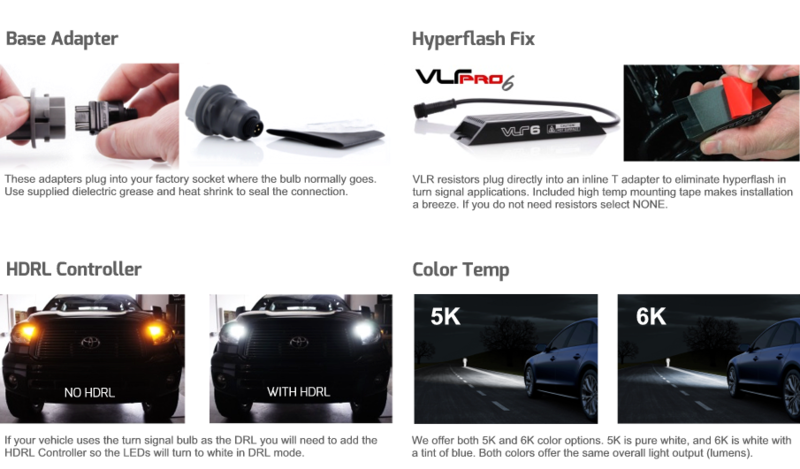 I used to be an iJDMTOY customer because of their lower price and good quality and took a leap of faith on VLEDS and it is definitely well worth the higher price. Quality is great, light output is amazing and installation was fairly simple. I have pre-ordered their LPR reverse lights and if they are anything like these V6 Tritons then my expectations are very high and i am sure that ill be very happy. I previously had the V3 switchbacks in my Maxima. While the V3s were great they didn’t have as much output as I liked in my application. The build was great at the time, but with the new V6 Tritons, VLEDS stepped up their game to make a good product even better. I waited anxiously for the V6 tritons to ship. I waited since late August. With a few set backs that pushed the predicted ship date to late December/early January. I’m happy they did. VLEDS made sure their product was going to be perfect. I rather have waited then file a warranty claim in a couple months or just not be happy with the product. Furthermore, the V6 tritons have a good strong one piece build, and are a lot smaller then their predecessor. Light output is much better and the 6k bulbs match my CBI HIDs near perfectly. Amber turn signal has a crisp orange color you will love. We can thank VLEDS using CREE LEDs. Installation is very straight forward. Look up detailed instructions on their site and you’ll be set. The bulbs come with a dimming wire that will dim the running lights 10%. Gives a good OEM feel. However, I skipped that as installing that was out of my knowledge. But it’s there and available to do so if you know how. In addition, make sure to pick up the VLR-6 resistors and T harness to fix any hyperflash you’ll get switch from regular bulbs to LEDs. VLR-6 resistors also have a stong build quality you’ll feel right out the box. Other than that, VLEDS made a great product. I will always recommend them and buy from them. I had some other LED switchbacks in my FR-S from another reputable vendor, but the amber color and brightness wasn't cutting it for me. Waited for these V6 Triton switchback since July this year, and it was worth the wait. The white parking lights are much brighter than the ones I replaced, and so are the amber turn signals. Even better is that they're lighter in color, which I prefer, and match the HVA bulbs I have in the side markers and rear turn signals. Haven't gone out for a drive after installing, so I won't find out how they perform in real world driving. I know the previous switchbacks didn't even reflect off of traffic signs when signaling, so I'm hoping these do. Did not wire the parking lights to dim with headlights, so I can't comment on that. I did get confused on installing the V6 Triton though, as I have never installed bulbs that utilize bolts to make the locking tabs. Took me a while with some trial and error to find out that for the zenki FR-S/86, that the collar should not be used, and only two of the 4mm bolts on opposing sides should be used. After figuring that out, I swapped the other side in a minute or two. Perhaps a more descriptive explanation of what the collars and bolts are used for would help lessen the trial and error time.